Baggy Joe? ... was that you, Andy? MatraSport Forum > Each model > Bagheera > Baggy Joe? ... was that you, Andy? Re: Baggy Joe? ... was that you, Andy? It certainly is Baggy Joe! Well spotted! Mick Ward of the Simca Club organised the "stand" and I was one of several members who attended although the only Matra-Simca present. The magazine "Practical Performance Car" was the sponsor of the event and before that I had not seen the magazine. Its aim is "Performance Tuning for Grown-Ups". There was an amazing array of cars most of which had been modified in some way e.g. performance, cosmetic or just plain restored. 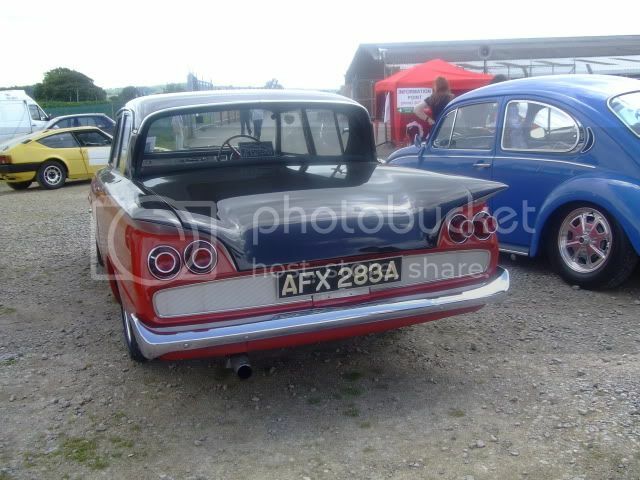 The Ford Consul Capri in the foreground is a good example with its strange tail lights-exhaust outlets. But what a great finish? My favourite was a Vauxhall Cavalier which had "Nitrous Oxide" boost equipment added to the non-original Turbo-Charger. The exterior was standard and there was no obvious clue as to what was under the bonnet". A true "Wolf in sheep's clothing". A bit like the 3.5Litre Rover V8 I always planned for my Morris Minor in the 1960's and never built! The Haynes Test Track was open if you wanted to see what your car would really do - rather than just boast about it. I settled for a run on the mobile Rolling Road to see what power the Simca engine in Baggy Joe was producing. I used the same machine at its normal base near Stanstead Airport to check again after we had fitted the supercharger. Experts and enthusiasts in car "Originality" would not have enjoyed themselves. Most cars were driven there although some, including Baggy Joe, arrived by trailer. I can also recommend the magazine and I purchsed a subscription at the NEC Classic Car show last year. Seeing how other people's ideas are put into action is very interesting and the workmanship has to be seen to be believed. Gives me something to aim at! Ship's engineers like me are happy if something works OK and are not too fussy as to how it looks. When your "working" car goes on show you realise how scruffy it is. Motivation is handy sometimes! The magazine also organises track days for very modest money. I went to Mallory Park on one of their events but missed their later Cadwell Park trip. Try it if you see the mag on a bookshelf. Check if you are still young enough (or confident enough) to enjoy being different! Keeps you young! The chap I bought my Bagheera from mentioned Mick Ward. I think he said that Mick had a non-standard Bagheera which he restored and may have and engine conversion (? ), perhaps I'm wrong. I'm broadminded enough to tolerate a little 'sympathetic' modifying of rarer cars and a more 'anything goes' attitude to the common stuff. It's amazing to think of how many Escorts and Beetles were chopped up in the 70's and 80's to build kit cars. Certainly wouldn't happen now! I will look out for the magazine. I've more or less stopped buying magazines now because I've always been a bit of a hoarder and have a large aount of older stuff. If I want to check something now, I try to save money and space by finding it online. I would say that am fussy about how things look but lack the mechanical know-how, equipment and space to carry out most of what I'd like to achieve. I've just started getting hands-on with cars quite recently and wish I'd begun twenty-five years ago! It gets frustrating (and expensive) paying other people to do things I'd like to be able to do myself and, with the sort of cars that interest me, I really could do with the practical skills. I certainly do enjoy being different, or at least, have a taste for the non-mainstream or obscure when it comes to many things. Thanks for the reply Andy, a good read as always. Fred wrote... The chap I bought my Bagheera from mentioned Mick Ward. I think he said that Mick had a non-standard Bagheera which he restored and may have and engine conversion (? ), perhaps I'm wrong.